New Romy's fish and chip shop opens today (Friday, January 20). 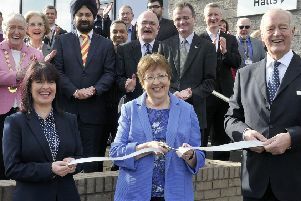 Twenty new jobs will be created thanks to the new Romy’s Chip Shop in Hillfoot, Bearsden, and a new restaurant nearby. The popular chip shop, which has been there for 30 years, is going to be transformed into a new restaurant which will be run by Laura Colaluca and her husband Ralph. Laura is the daughter of the original chip shop owners Angela and Romy Bruno. The new chip shop, which opens today (Friday, January 20) at 4pm, is a couple of doors down from Raffaelle’s Italian Kitchen & bar on Milngavie Road, which is also run by Laura and Ralph. Angela and Romy bought the original Romy’s when it was still a local library and transformed it into a chip shop. Angela said: “It’s a new year, the perfect time for a change.